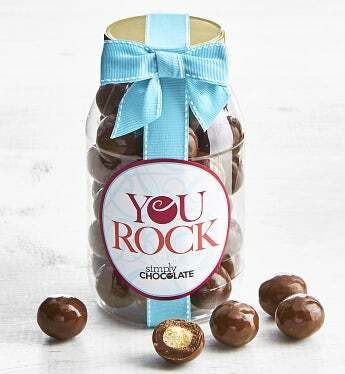 Express your appreciation for a job well done or show a friend or family member just how awesome you really think they are with this fun gift jar. Inside they will find premium chocolate malted milk balls packed in a resealable quart jar tied with a bright teal blue ribbon with white stitching. They’ll love the taste of this amazing malted milk balls!